Is exercise good for your heart? Yes, it is. Your heart is a muscle and needs exercise to stay in shape. When it’s exercised, the heart can pump more blood through your body and continue working at optimal efficiency with little strain. This will help it to stay healthy longer. Regular exercise helps to keep arteries, blood vessels flexible, ensure good blood flow, regularize blood pressure, increase good cholesterol, and lower bad cholesterol – thus keeps your heart heathy. Being physically active is important to prevent heart disease (the America’s No. 1 killer) and stroke (the America’s No. 5 killer). 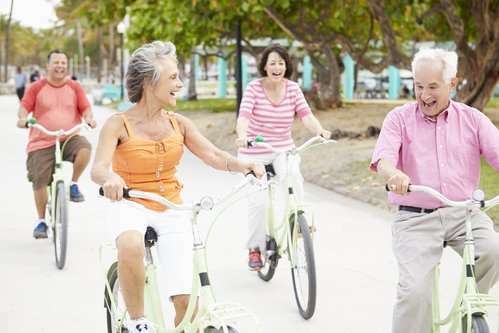 According to American Heart Association (AHA) recommendations, the adults can improve their overall cardiovascular health by doing moderate exercise for at least 150 minutes per week or 75 minutes per week of vigorous exercise, or a combination of both moderate and vigorous activities. Most heart specialists recommend exercising for at least thirty minutes a day, five times a week. You can also divide this time into 2 or 3 segments of 10 to 15 minutes per day as per your convenience, and still will be benefitted. And for the people who are seeking to lower their blood pressure or cholesterol, AHA recommend 40 minutes of aerobic exercise of moderate to vigorous intensity three to four times a week, which will eventually reduce the risk for heart attack and stroke. Don’t get intimidated even if you you’ve been sedentary for years or have never done any exercise before. Everyone has to start someday – somewhere, and today is the day for you to turn around the things. Take up now to make healthy changes in your life. If you think you can’t do it for 30 or 40 minutes, set an attainable goal today for yourself. You can then work up toward your overall goal by increasing your time, as you get stronger. Don’t let all-or-nothing thinking deprive you of performing what you can every day. Keep in mind to talk to your doctor before taking an exercise plan. He’ll ensure that you’re ready for whatever physical workout you have in mind and advise about any limits on what you can do. (i) Brisk: Raises the heart and breathing rates. (ii) Sustained: Maintained between 30 to 60 minutes without interruption. Aerobic exercises that strengthen the heart and lungs include: aerobic dancing, bicycling, brisk walking, stationery cycling, hiking uphill, jogging, jumping rope, running in place and swimming. Note: Some experts advise that you need to do the cardio fast enough to raise your heart rate and breath harder, but you should still be able to talk to someone while you’re doing it. Otherwise, you are pushing too hard. If you have joint problems, choose a low-impact activity, like swimming or walking. Sedentary persons have higher potential risk for the later development of cardiovascular disease. Whether or not you are currently engaged in a regular aerobic exercise program, to improve your cardiovascular health, adding a daily 10-20-minute stretching program not only help wake up your muscles and joints to the prospect of regular exercise, but also offer you a short-term protective cardiovascular benefit. Many experts point out that strength training often gets overlooked for its importance in improving cardiovascular health. Actually it can be a helpful addition in reducing the risk of heart disease. Studies have suggested that when it comes to improving certain markers of heart health, strength-training is just good, but of course not better than cardio. You can use weights, resistance bands, or your own body weight for this. Do it 2-3 times a week. Let your muscles recover for a day between sessions. How Much Cardio Should I Do For Heart Health? (i) A minimum of 30 minutes of moderate-intensity aerobic activity at least 5 days a week for a total of 150 minutes. (iii) Moderate- to high-intensity muscle-strengthening activity for a minimum of 2 days per week for additional health benefits. (i) When you cannot do the recommended amounts of physical activity due to health conditions, you should do as your abilities and conditions allow. (ii) It’s normal for your muscles to be mildly sore for a day or two after your workout when you’re new to exercise. As the days passes soreness will fade and you will get used to it. Check with your doctor before starting any exercise routine. Follow these guidelines while you’re working out. (i) Do not exercise if you are not feeling well. (ii) Pay attention how you’re feeling while exercising, especially warning signs such as pain, shortness of breath, or fatigue. (iii) Stop and ask for immediate medical help if you have pain or pressure in your chest or the upper part of your body, break out in a cold sweat, have trouble breathing, have a very fast or uneven heart rate, or feel dizzy, lightheaded, or very tired. Thanks for sharing these precaution tips while exercising. It is very important to follow these tips to prevent any type of injury. Keep sharing more articles.